At a recent customer install, I was faced with configuring Oracle Traffic Director (OTD) 12.2.1.2.0 Webgate with Oracle Access Manager. There is however a flaw in the documentation. I came across that when I reached the point where Webgate get's configured in the conf files of OTD. If you follow the documentation completely, you will end up with conf files that either have no WebGate configuration in them or with the configuration dedicated to the first OTD instance on both servers. In the latter case, the second instance will no longer start. I created a Service Request at Oracle support to address the issue. They didn't have a solution for the problem and I ended up being bounced between the OTD and the WebGate support teams. Finally one of the guys from the WebGate team really tried to help me, but couldn't resolve the issue. So I went along and solved the problem myself. As I will describe below. Where TST1 is the name of the configuration and host1.domain.local is the name of the first server. This will change the magnus.conf and virtual-server-tst1-obj.conf for Webgate. In virtual-server-tst1-obj.conf there are no instance specific references. However in the magnus.conf there are references to the first instance, since this is the one that we used with EditObjConf. 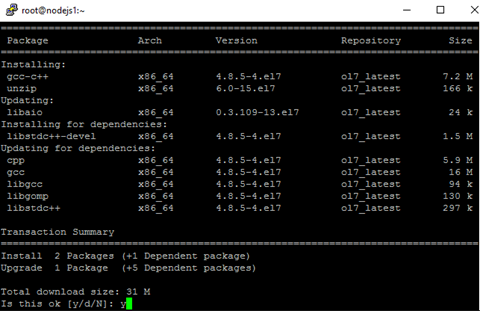 This is what the magnus.conf in the OTD configuration section (on global level) looks like after EditObjConf command. Notice the hardcoded instance name in four places. # Copyright (c) 2011, 2016, Oracle and/or its affiliates. All rights reserved. # if two different instances have configured the directive with same value. # model, i.e. use same location as original file that lock is based upon. Leaving it like this will result in this hardcoded instance name being distributed to all instance. Hence only one instance would start. Now how to fix this. In our example the magnus.conf now looks like this. 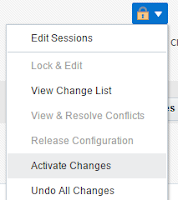 EM will show the Pull Components Changes bar. 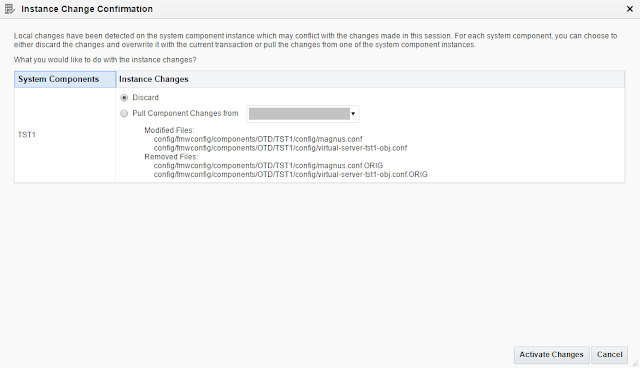 This will replace the conf files of the configuration with those currently in use by the instances. Instead make a minor, insignificant, change in the configuration. Discard the Instance Changes and Activate Changes. And finally Discard Changes to distributed the correct conf files to the instances. # WebGateLockFileDir: Optional directive specifying the location to create # webgate lock files. The files look good on both instances. Now you're good to go with WebGate correctly configured on OTD 12c. Today I received confirmation that two sessions have been accepted by DOAG. Both sessions in the stream Middleware. Looking forward to present at DOAG2016 on 15th -18th november 2016 in Nuremberg. Let's start by connecting the two nodes of the ODA directly to each other using Cat. 6 Ethernet cables. Make sure that the cables are long enough to route them through the Cable Management Arm. This way you don't have to disconnect the cables when you have to do maintenance on the nodes. Now actually, you have a private network configured that you can assign to the VM's. Note. Don't change the primary public IP addresses this way!!! Before you configure the SCAN listeners we are going to add some entries to the /etc/hosts file of the ODA_BASE on both nodes. Unfortunately the fix for this bug didn't make it to the next release, nor the patchset of version 12.1.2.7.0.
oakcli configure vm <vm name> -network "['type=netfront,bridge=net1','type=netfront,bridge=net2']"
oakcli configure vmtemplate <vm template name> -network "['type=netfront,bridge=net1','type=netfront,bridge=net2']"
Let's take a look at the pictures I used in the previous blog, which are part of the design as an example. In this design I configured the Oracle Traffic Director (OTD) and Fusion Middleware (in this case SOA Suite and MFT) VM's with two interfaces. Note. The public interface on the FMW VM's is only used for SSH. 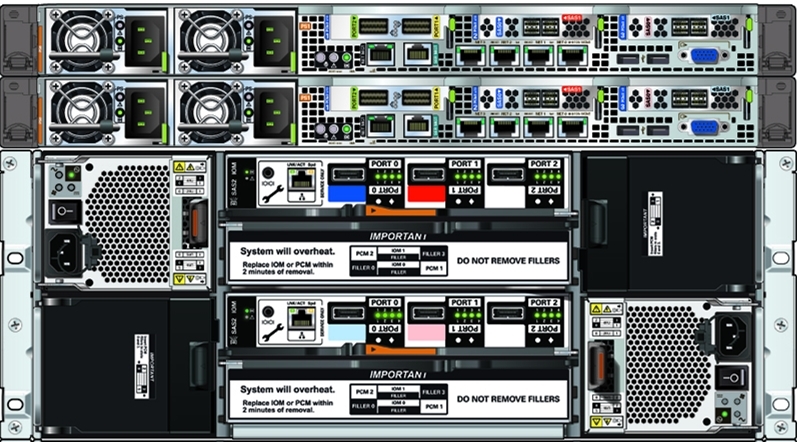 When you buy an Oracle Database Appliance (ODA) X5-2 off the shelve, you will get a machine with four times 10Gb copper Ethernet (bonded into two interfaces) for public communication and two 40Gb InfiniBand (bonded into one interface) for interconnect communication between the two ODA_BASE's. You would think that should be more than enough. Well in most cases it is. The interconnect running through InfiniBand is stunning for RAC and the public interface should be enough for most uses. Oracle is doing a great job in selling the ODA X5-2 to their customers. It is a great machine with a lot of capabilities especially when you implement it with a Virtualized Platform Setup. In this configuration an Oracle VM hypervisor is put on top of the hardware and the ODA_BASE is placed in a special virtual machine (VM). 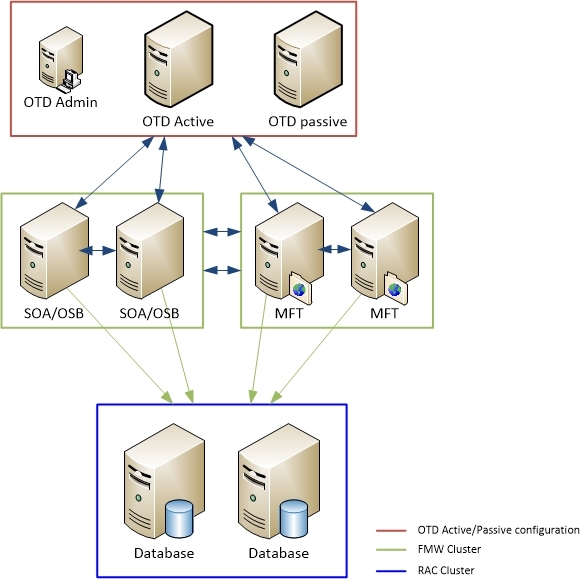 The ODA_BASE is primarily used for running all databases and for managing, almost, all aspects of the entire ODA X5-2. Besides this special VM, you can create your own VM's. This gives you the opportunity to make optimal use of the hardware the ODA has to offer and keep track of your licenses. 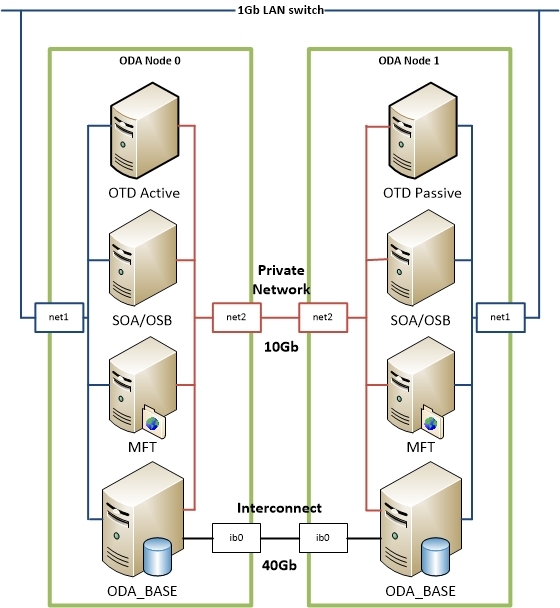 For most of our customers the virtualized ODA provides a one-box solution for their Fusion Middleware (FMW) implementations. At a customer where I was asked to setup two ODA's last year this was also the case. They bought two ODA's with the standard configuration. Again the switches at the customer site supported 10Gb on fiber, but not on copper. Their copper switches supported 1Gb only. You can replace the InfiniBand card with a 10Gb fiber card, but this was not ordered and the ODA's where already re-imaged by an Oracle Engineer. Ordering the fiber cards and re-imaging the ODA's would delay the project too much, so I was asked to provide a solution with full bandwidth between the VM's (with clustered FMW products) and the Oracle databases on the ODA_BASE. Another solution would be to use the InfiniBand interface for this purpose. This would involve installing and configuring InfiniBand drivers, etc. in the VM's. 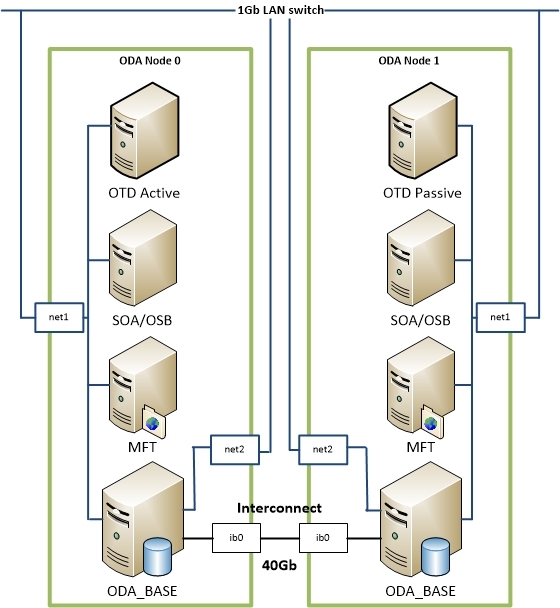 (There is a whitepaper from Oracle about the configuration of InfiniBand on VM's.) This was considered as an option, but the use a normal Ethernet connection was favored because the impact on the VM's is minimal with that configuration. In my previous article, First setup of a connection from Node.js to an Oracle Database, I demonstrated how to make a connection to a remote database using Node.js and the node-oracledb module. I used a dedicated VM with Linux 7 installed and Oracle Instantclient provided the 12.1 client libraries. Now it's time to take it a step further. Let's create an application container and just start it multiple time running any .js script and be able to connect to an Oracle database. For this setup I have installed Docker on an Oracle Linux 7 VM in VirtualBox. Logon as root (or use sudo) on the Oracle Linux VM. First we need an operating system for the container. Pull docker image of oraclelinux from the Docker hub. Now start an interactive Docker container. Within the container we will creating a non-privileged user and install the required OS packages (including dependencies). The user can be used to run Node.js scripts in the container without root privileges. Exit the container and commit the container to create a base image. Now that we have a base image, we are going to run a new container based on this image. I have downloaded the Oracle Instantclient from the OTN site and put them in the /tmp/Downloads directory. Start an interactive container using the created linux-base image and share the /tmp/Downloads directory using a volume in Docker. Use curl to download the Node.js software from nodejs.org and the linux pipe (|) function to pass it to the tar utility which unpacks the software in the /opt/ directory. 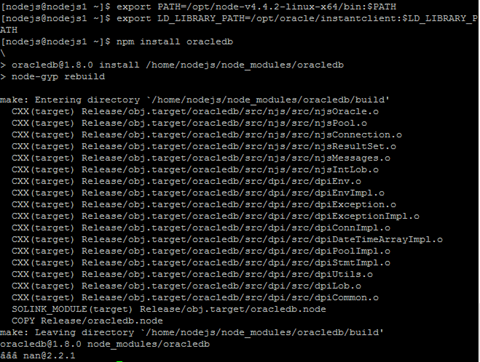 The node-oracedb will be installed as global module by the npm (node package manager). Before running npm, set some environment parameters so the node binaries are in the search path and the Oracle libraries can be found. Now that I have created the Node.js enabled image, I can test the functionality of it. I have downloaded examples scripts from de node-oracle/examples on Github. Start with running a simple select1.js against an Oracle database. This script connects to the database and selects one row from the Departments table. I have an Oracle Database 12.1.0.2.0 pluggable database running on a separate VM, with the Oracle example schema's installed in it. I need to provide some environment variables to provide the PATH, user, password and connect string for the .js scripts to be able to connect to the database. Create a file called env.list and place the following entries in it. I know, I know… Putting a plaintext password in a file is not secure. Keep in mind that this is for demonstration purposes only. Don't do this in any non-demo environment!!! Run the container with the necessary parameters. Let's walk through the parameters of the docker run command I used. Add a host entry for the database server to the /etc/hosts file. This is used because I don't have a DNS server running. Add a volume to the container, mapping a local directory to a directory in the running container. In this case this mounts a directory with the .js scripts I want to run. So you don't have to add the scripts to the image, making it not dependent on script changes. Command to run in the container. Run node command with the select1.js script. YES!!! The scripts ran correctly in the container. In the previous chapters I have created a Docker images that can run Node.js with the capability to connect to an Oracle database. As you have seen, this involves a lot of manual labor. Manual labor, means greater change of mistakes. So let's automate the way to create this image. In the next steps I will create and use a Dockerfile to automated the creation of the image. A Dockerfile is a text document that contains all the commands a user could call on the command line to assemble an image. Using docker build, users can create an automated build that executes several command-line instructions in succession. Create an empty directory to place the Dockerfile in. I will use the same Instantclient zip files as previously downloaded. From the docker-file directory run the docker build command an tag the created images with a name and version. Note. Mind the . at the end of the command. It says, build the image using the Dockerfile here. Skipping the yum install lines …. Now let's see if the image works. Remove the PATH, LD_LIBRARY_PATH and NODE_PATH from the env.list. These environment variables where already provided in the Dockerfile. Yeah, it works as expected!!! To test the functionality I used Node.js to run a sql script. The same Docker image can be used to run other .js scripts. As another example, run a simple webserver. Btw. Don't forget to kill this running container when you're done. In this article I have shown you two ways to create a Docker image Node.js with a functional node-oracledb module. There is now right or wrong way to create the image. It is however much easier to use the Dockerfile method. It is fast, easy and prevents human errors. Also, if you want to add modules or functionality to the image just add the commands to the Dockerfile and create a new image in a couple of minutes. If you install it local to the user, you don't need to be a privileged user. You can choose any user you need to run Node.js. For this demonstration I created a user called nodejs and will install the module local to the user. Deliver my presentation "Dynamically scale Weblogic in a private Cloud" on the OGH DBA / Middleware day 2015 today at 13:15.